so I had to put it up. A Seal Concert where they actually allowed kids. We had purchased tickets that included a meet and greet. buying those tickets and "met" him numerous times. and I flew to CT (in a fricken snowstorm) by myself. Thus pretty much sealing our STALKER status. 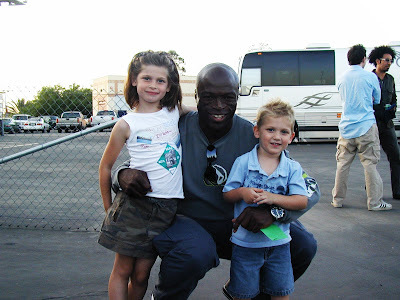 So here you have my children and Seal. How totally ROCKIN' is this??? I think you "SEALed" your stalker status when you named Garrin "Garrin Seal Herbst." Okay, kidding, but I bet you considered it! WOW! Now I realize just how much you really DO love Seal. What an awesome picture to have, but I'm sure it's one of many adorning a shrine somewhere in your house. AWESOME stalker Chick, and raising your kids to be stalkers is even better !!! WAY rockin... girl... that is SO awesome! that guy has some serious pipes! My brother actually booked the show at HOB and thought he was a great artist to work with. It's always cool to meet someone you admire. Even better to get a pic of your kids with them. All you're missing is Bill in the picture and you'd have the ones you love the most (at the time) in one shot. I don't understand the Seal fascination, per se, but I understand obsessions, addiction and stalking. So, I loved this TMBT!! And do you remember the first time you touched him? Back in CT...in New Haven! that was some night!